Based on the EML downloader code I created a more convenient downloader. It is placed in the context menu if you right-click a message (or a bunch of selected messages). It creates the filename from the subject, with a maximum of 64 characters, and adds the .eml extension automatically. Works for multiple selected messages. Works only with Zimbra Web Client and has been tested with Firefox and Chrome. IE/Edge might or might not work (I don't use them). 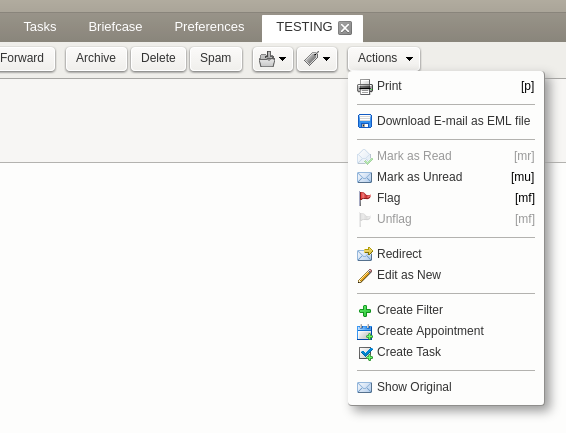 I also created the same Zimlet for Zimbra Desktop, search here for "EML downloader in context menu for ZD" zimlet. adds "Download" menu item in the Actions menu, when the e-mail is opened with a double click. Works only when the e-mail message is opened on a new application tab, and does not yet work if the e-mail message is opened in a new dialog window. Version 1.2 update: fixed bug email could not be downloaded if email size (with attachments) was bigger than 2MB.